Derived of the naturally occurring mineral Olivine, peridot is a rare stone rich in magnesium and iron, and most commonly found in an olive green color. 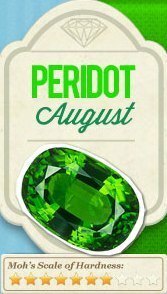 Found in volcanic lava, peridot is mined primary in Brazil, Kenya, Germany, Mexico, Australia, and the Hawaiian islands. Did You Know? According to ancient legends, peridot has the power to protect and purify and also reduce anger and jealousy. As a medical remedy, it was powdered to cure asthma. It was also believed that holding a peridot under the tongue lessened the thirst of a person suffering from fever.